We recently had dinner with my mom and Gene, and mom invited a neighbor couple to join us. These people have been so nice to them that she wanted to take them out to dinner and treat them. They are just the nicest people you’ve ever met. Really, really delightful people. After a lovely night out, they felt compelled to send a thank you to my mom. And although they live within walking distance, they actually put a stamp on the card and sent it in the mail. Talk about one-up-manship, how’s anyone supposed to compete with that?! 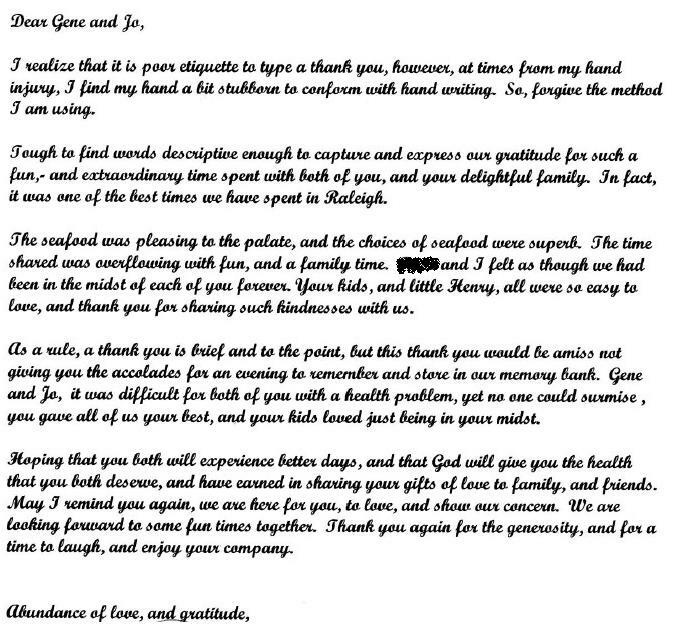 But it’s the contents of the letter that are just jaw-dropping. Please recognize that I’m not (entirely) making fun of this couple – they’re fabulous, as I’ve mentioned. But oh my goodness, it’s a bit over-the-top, isn’t it?